Opinion: For Restaurant Staff, A Rare Chance To Protest The Trump Administration NPR's Scott Simon reflects on recent protests of Trump administration officials at restaurants. 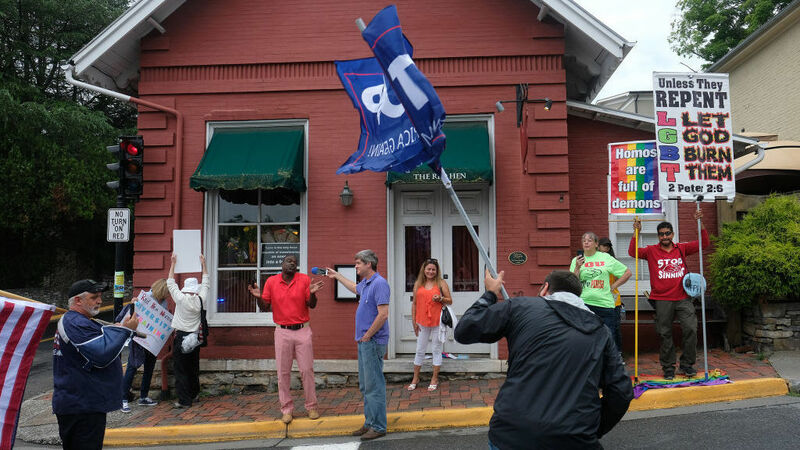 Protesters in front of The Red Hen in Lexington, Va. on Tuesday, June 26. White House press secretary Sarah Sanders was asked to leave the Red Hen restaurant by its owner. If Sarah Sanders or Kirstjen Nielsen came to our studios — and I hope some day they will — I would thank them for coming, and be professional and pleasant. But when the mic light went on, I would have to ask why so many of the children who have been separated from their families at the border are still locked up in detention centers. Reporters can have the chance to ask. Most citizens don't. Another national debate about civility was set off when a Virginia restaurant refused to serve the president's press secretary, and protesters heckled Homeland Security Secretary Nielsen at a Mexican restaurant in Washington, D.C., shouting, "Shame!" and "End family separation!" Rep. Maxine Waters of California said that officials in the Trump administration should be called out in public over their family separation policy. "They're not going to be able to go to a restaurant, they're not going to be able to stop at a gas station ... the people are going to turn on them, they're going to protest, they're going to absolutely harass them until they decide that they're going to tell the president, 'No I can't hang with you.' "
But David Axelrod, President Obama's former senior adviser, tweeted, "Kind of amazed and appalled by the number of folks on Left who applauded the expulsion of @PressSec and her family from a restaurant. This, in the end, is a triumph for @realDonaldTrump vision of America: Now we're divided by red plates & blue plates!" I read tweets from people who assail me as a "tireless apologist for civility," and I hope to treat everyone we interview with courtesy. But who are the people in restaurants who prep and cook, serve food, bus tables and clean up when guests have gone? Many immigrants, who feel they've been special targets of the Trump administration's policies and rhetoric, as when the president said immigrants "infest our Country." It might have been more polite or politically effective for protesters or restaurant staff to just let the Trump administration officials eat in peace, then approach them to say, "We profoundly disagree with what you've done." But I understand how people who see public figures they hold responsible for what they find a reprehensible policy that tears apart lives will decide they just can't walk past what may be their one chance to say something directly to people in power. In words from Hamilton, they're "not throwing away" their shot.